Strongwell would like to extend a hearty “congratulations” to the University of Tennessee’s ASCE (American Society of Civil Engineers) group on their recent achievements during the ASCE student conference at Florida International University and the University of Miami. This group of young professional engineers placed 6th overall in the competition which was scored cumulatively amongst 15 different events. Over 20 different schools from the Southeast region participated in the multi-day event. One of the events was to build and compete in races with a concrete canoe. Strongwell was asked to donate fiberglass raw materials so students could build a lightweight, 40 lb. canoe mold and a trowel to define the shape of the keel. 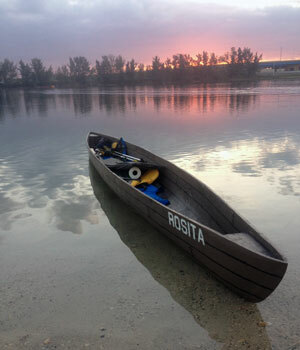 The canoe was built by casting concrete around a male mold consisting of extruded polystyrene foam, tile grout and fiberglass. Nathan Cross, captain of the concrete canoe team stated that both the use of fiberglass in the mold of the concrete canoe and the keel creation were experimental in the beginning, as this was their first encounter with the material. 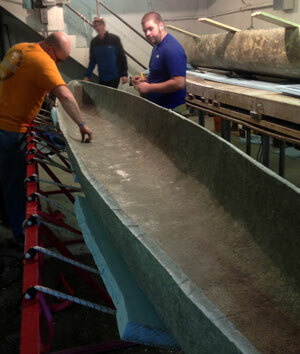 Being able to create the mold makes future concrete canoe builds much easier and lighter to transport. Out of all the teams competing within the ASCE Southeast Regional competition, they were the only ones who utilized a fiberglass mold and constructed a keel. They finished in 11th place in the canoe portion and came in 6th in the men’s sprint competition. Although this placement fell short of their expectation the team has already been researching and eagerly implementing what they’ve learned from this year’s competition for next year’s events.